Description: Ex CR 8316 leads NS 18N through Bethelehem. Description: CEFX leads an unknown inbound freight train at deButts Yd. Description: heading south through Kannapolis CEFX 3156 sits infront of a sister lease unit. Description: NS 134 hauls a rent-a-reck d.i.t. to KNoxville. Description: A CEFX SD40-2 at the south side of Portside with power to be turned. Description: An ex-Union Pacific CEFX SD40-2 at the south side of Portside with power to be turned. 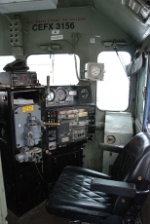 Description: A look inside the cab of CEFX 3156. Description: Lehigh Road, 0843 hours. Description: NS Westbound Local Freight Train passing through Vine Street in Decatur, Al. Title: CEFX Bluebirds leading the way!